In 2017, Peach State Roofing’s Birmingham, AL office completed a re-roofing project at Point University located in West Point, Georgia. The campus of this university is located right near the Georgia/Alabama line. The specific building in which PSR was hired to re-roof was the Scot Fine Arts Center. Consisting of approximately a 3,000 square foot roof section, this building was actually an existing car dealership which was being converted as part of a “re-purposing project.” The building is approximately a 20 ft tall building in elevation (single story building). The existing roof assembly on the building was that of actually three roof systems. The top layer was PVC membrane on top of another layer of PVC membrane over a polyiso roof insulation board which was over a built up roof (BUR) over a wood deck. In the negotiation process with the university, installing a roof system to meet all building code requirements and construction practices was the key driving force. With that being said, a scope of work was selected in which PSR tore off all of the different roof layers down to the original wood deck structure. The wood deck was inspected for damage or deterioration and replaced as needed to meet structural requirements. Once the deck was confirmed as being in a suitable state, the new roof installation process began on a new section each day. The roof system installed in place of the existing was a Carlisle 60 mil white TPO membrane roof system. Rolls sizes were 8’x100′ and once laid out, they were fastened at 12″ on center in the laps. Lifting all of the HVAC units which had low flashing heights was something in which PSR had to pay close attention to so that it didn’t interfere with the buildings HVAC needs. At all of the wall flashing locations, new plywood sheathing was installed and membrane was fully adhered on all of the wall flashings. 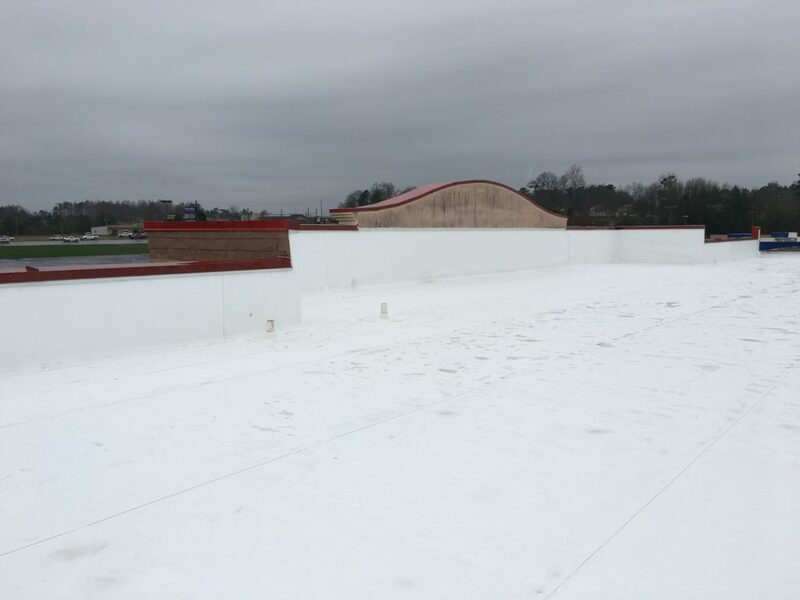 Once the membrane was wrapped up and over all of the parapet walls, new 24 gauge Kynar pre-finished metal coping was installed in place of the existing coping systems. Steve Brooks who has been with Peach State Roofing out of the Birmingham, Alabama office for 7 years was the project manager for the re-roofing work. Some of the additional details Steve stated he had our crews complete on the work was to wire brush and paint all of the drain strainers along with installing all new drain hardware at each location. He also had PSR crews install all new wood blocking pipe supports and new condensation lines at each of the HVAC units. The project took about a week to complete and upon completion it received a Carlisle 20 year warranty to go with a Peach State Roofing contractor’s warranty. The site was inspected by a Carlisle roof inspector from the state of Georgia and verified to be in compliance with all Carlisle roofing system requirements.